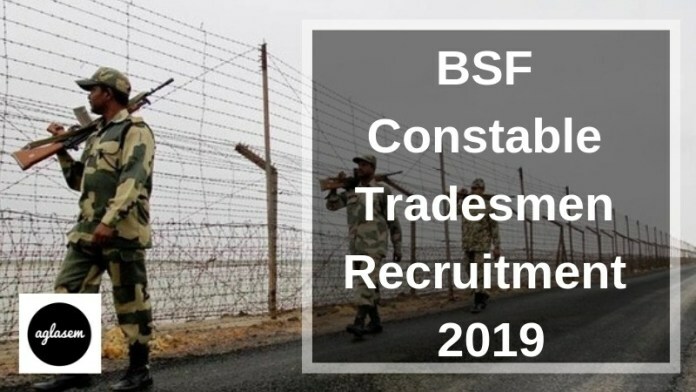 BSF Constable Tradesmen Recruitment 2019 – The Border Security Force (BSF) will release the notification of BSF Constable Tradesmen Recruitment 2019 on February 02, 2019 at bsf.nic.in. As of now, the notification is available on the official website of the Bureau of Outreach & Communication at davp.nic.in. Through this recruitment process, the BSF is going to recruit the 1763 vacancies on the post of Constable tradesmen on different trades. On the same day when the notification and application will release the candidates can send their applications in offline mode. The last date to send the application form to the BSF is March 03 2019, but for the candidates, far-reaching areas have to send their application form till March 18, 2019. Get here all the details of BSF Constable Tradesmen Recruitment 2019. Latest: The notification of BSF Constable Tradesmen Recruitment 2019 will be released on the following in employment newspaper. BSF is inviting the application form from the candidates who have passed the class 10th and have a certificate in their trade. The selection process of BSF constable has not been specified. Even application fee is also not yet released. In this recruitment process, the recruitment agency of Border Security Force (BSF) has announced total 1763 vacancies. In total vacancies, 1761 vacancies are for male candidates, where only two vacancies for female candidates of the unreserved category. The post for which the major vacancies are reserved is Cook, for this post 561 vacancies are there on which only male candidates can apply. The candidates can check the post wise and category wise distribution of vacancies. The candidates who meet the following eligibility criteria laid down by BSF are eligible to apply. Gender: Male and Female both are eligible. Age Limit: The candidates of 18 to 23 years are eligible to apply. The date of birth will be calculated on August 01, 2019. The candidates should be a minimum of 18 years and should not be more than 23 years on or before August 01, 2019. Educational Qualification: The candidates who are willing to fill the form should have the following qualification. It is mandatory to pass class 10th. As the recruitment is for Tradesmen, hence the candidates should have any one of the following. Experience of 02 years in the respective trade. Or should have the one-year certificate course from Industrial Training Institute. Or Two-year diploma from ITI. Note: The BSF will provide preference to multiskilled candidates. Physical Standard: The candidates should fulfill the physical measurements decided by the BSF recruitment body. Garhwalis, Kumaonis, Gorkhas, Dogras, Marathas and Candidates of Sikkim, Nagaland, Arunachal Pradesh, Manipur, Tripura, Mizoram, Meghalaya, Assam, Himachal Pradesh, Kashmir, Leh & Ladakh regions of Jammu and Kashmir. As per the schedule, the BSF will upload the application form on the official website at bsf.nic.in. The candidates will have to download the application form and print it on an A4 sheet. The candidate has to send the duly filled application form along with the admit card. After filling the admit card the candidates have to send the duly filled application form to the Headquarters of BSF. Union territories on India such as Andaman and Nicobar Islands, ad Lakshdeep. As of now in the notification, the procedure of selection has not been released yet. The selection fo the candidate’s may be decided by an examination or just by preparing the merit list. The details of the selection process will be released in at the time of application form releasing. After all the selection processes the result will be declared by the BSF. However, the mode of the announcement has not been told yet. This is sure the name of selected candidates will be shown after the recruitment process. For the recent information about the recruitment, the candidates have to visit their BSF official website. For more details of BSF Constable Tradesmen Recruitment 2019 download the advertisement.